Dallas General Pest and Termite Control, a family owned business, has been serving the local community since 1992. During our 27 years of business, we have expanded service to all of Los Angeles County and even include a monthly visit to Bakersfield. Our increased route size has not taken us away from our local business values; we will always be respectful to you, your home, and your belongings. Whatever your situation may be, Dallas General Pest and Termite Control is the solution. Our Santa Clarita pest control team specializes in customer service and is highly sensitive to your specific needs. Long term pest relief? Green pest control? Concerns about the health of your family? Pet Safe? No problem! Great service, honest, and professional. I could not have found better service than I got from Dallas Pest Control! It was fast, unbelievably friendly, and, very affordable. I highly recommend their service. We have been with Dallas General Pest & Termite for many years. They are always prompt, courteous and considerate of our Golden who is often left in the garage if we are not home. If we have ever had an issue with pests, they are a phone call away and quick to respond. I would recommend them to anyone considering a pest control service. LC. Everything has been fine with the service for about 1 yr.
Great service and if there’s ever any issues, Nick takes care of it right away. Thank you! Dallas General Pest was very professional and explained all there work. Dallas Pest Control did a great job on removing the pest from my attic. I recommend them. They also do my bimonthly maintenance so I have no problem with small bugs nor ants in my house or yard. I Love Dallas Pest control. Always on time always courteous best pest control I’ve ever hired. Please give us more than one day when notifying us of service call and indicate the window time for the service call so we don’t give up an entire day. Thanks. Friendly, courteous and knowledgeable about little critters and their habits! Reasonably priced too! I'm very happy with your service! Your techs are always right on time, very friendly, knowledgeable, professional, and do a great job! I would highly recommend your service (and do!) to everyone. Keep up the great work! This company team is "over the top". I called with an urgent issue - a bat flew in my house - and Nick Dallas was at my house in hours. They started work that day and I am so pleased with the end result. Ben and Bobby took pictures and my attic has no more openings. Planning to use this company for all pest control needs. The team proved reliable, professional, and have an outstanding work ethic. Nick and Ben were friendly, professional, and effective. Took care of our garage rat problem immediately and we have had no further issues. Reasonable prices and no unnecessary upselling! Highly recommend this company! I have been using this service for almost 2 years now. I called them initially for a rodent problem and since that was swiftly taken care of I now have monthly spraying outside for multi legged pests. They always call or text the day before they come to spray and are extremely conscientious. I fully recommend this service. 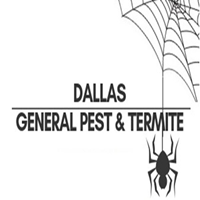 Dallas General Pest & Termite has great service! They are a wonderful company with exceptional service. You can tell they truly care about helping solve any pest problem you may have!